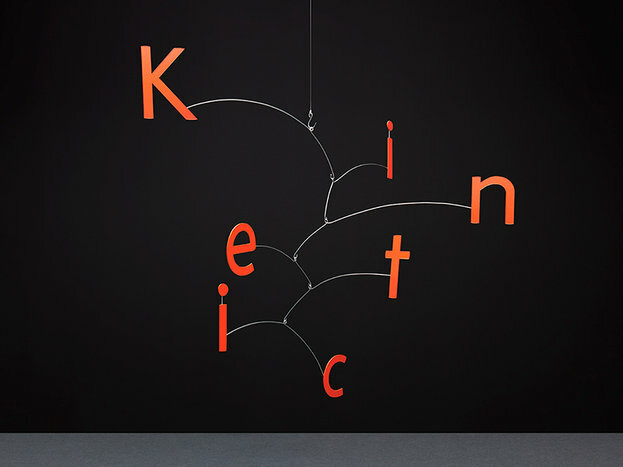 In Anlehnung an die Kunstwerke von Alexander Calder haben Noel Pretorius und María Ramos ihre neue Schrift Kinetic gestaltet, welche im Februar 2017 bei NM type erschienen ist. Kinetic ist eine geometrische Grotesk, welche sich hervorragend für Print- sowie Screenanwendungen einsetzen lässt. Einzelschnitte sind schon ab je 38,- Euro erhältlich. Slanted verlost 5 x ein Kinetic Booklet! Um an der Verlosung teilzunehmen, schreibt eine Mail mit dem Betreff »Kinetic Booklet« an verlosung@slanted.de. Die Verlosung endet am 10.03.2017 um 11 Uhr. Wer an der Verlosung teilnimmt erklärt sich damit einverstanden, News von Slanted zu erhalten. Der Rechtsweg ist ausgeschlossen. Viel Glück! Kinetic is a typeface family created by Noel Pretorius and María Ramos. One of the main sources of inspiration for the design was the art of Alexander Calder. He started working with moving sculptures in Paris at the beginning of the 1930s. The light, playful and soft appearance of Calder’s mobiles was something the designers wanted to translate into type forms. Kinetic is a geometric sans-serif that avoids strict design patterns. Although geometry is clearly present in the simple structure of the characters, optical corrections have been included and there is room for interpretation in the design of each particular character. Kinetic is a crafted design that comes in three weights with italics. It is a text typeface that was created with the reader in mind. Kinetic is a functional and modern typeface that feels comfortable to read. It’s a typeface family appealing for contemporary typographic use, both on print and screen. The design is intended for a wide range of applications which include advertising, editorial design, and any corporate or art project.